2004 - Bondurant 2005 GTO Test Drives Lot 1 of 4. CLICK-> Pontiac invited me to test drive the 2005 goat on hallowed ground. No, not the proving grounds in Michigan. The chosen site was the famous Bob Bondurant School of High Performance Driving! We're talking about the warmth of Phoenix, Arizona in the month of November. Yeah, baby! Not that I don't enjoy chilly Indiana days, but visiting the warm Arizona sunshine (and resulting suntan) was a nice side benefit. This is the sign that was on the track wall. I like how the logo has tire tracks on it. This is one place where they're not afraid to burn the rubber. Goodyear keeps the facility supplied with all the tires they can use. Prior to this visit, I had driven several 2004 GTOs at a summer GTOAA convention. So I had a pretty good idea how the car should accelerate and handle. I also knew what the 2004 GTOs looked like. 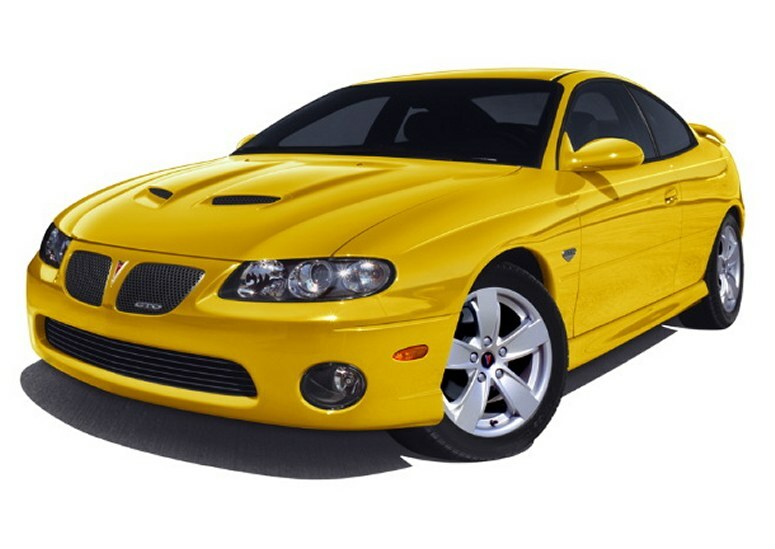 Before seeing the new improved 2005 version for the first time, I was really hoping Pontiac would give it an "extreme makeover", but that was too much to expect. CLICK-> This is a preproduction "pilot" car. It happens to be painted a very eyeball-pleasing shade called Impulse Blue. I hope you didn't get your hopes up that it would look a lot more "retro" for 2005. But the visual improvements are small steps in the right direction. Some Pontiac engineers were present to explain all the '05 upgrades before the driving event began. Test-driving new 2005 GTOs isn't such a bad job. Especially when you consider all the mechanical enhancements packed into this 4-seater in its second year of production. 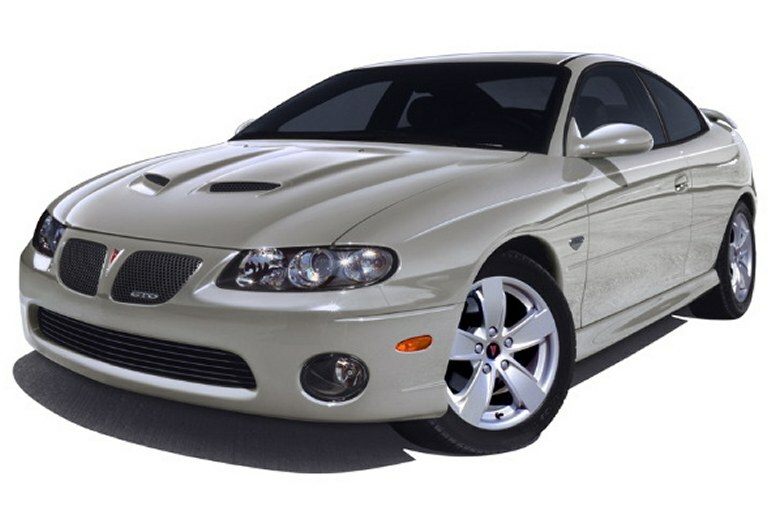 Consider that Pontiac engineers added 50 more horsepower by switching to the beefier LS2 engine. A new aluminum LS2 6.0L V-8 engine replaces the LS1 5.7L engine. They also changed the braking system, power steering pump, and more. CLICK-> Impulse Blue 2005 GTO, rear end view. Look at those large dual exhaust pipes that are on each side of the car for '05. This is a new feature. Driving into the track facility, I passed the many GTO test cars that were lined up along a fence. Seems like there was one of every color, decked out with the new scoopy hoods for '05. Inspecting the cars closer, you notice that the rear exhaust area has been improved in appearance. For 2005, there are dual exits for the pipes. They have brightly polished trim. This year, they're livin' large. Can you tell this car is a GTO from the rear? Yes, you can. The letters "GTO" are emblazoned right there on the rear fascia, large enough to read at a distance. Now you can also tell it's a Pontiac. Due to several requests, a "PONTIAC" emblem has been affixed to the trunk lid. CLICK-> This is where the healthy rumble comes from. For 2005, the GTO has dual exhausts that are split to each side of the car. I think this is a smart visual improvement that was made in just the right proportions. The prevailing style of "performance" cars is to put about a 3 inch tip on them. Pontiac has obliged. Don't dare call them "fart cans", man. Once you hear the sweet sound that comes from the backend, you'll be smiling. As far as the volume of the sound, it left me wishing it was a little louder. It doesn't quite compare to the rumble of, say, a '68 GTO with turbo mufflers. Maybe I like my cars too loud anyway. When I tear down the road, I want women, children, and small animals to cover their ears and run for cover! 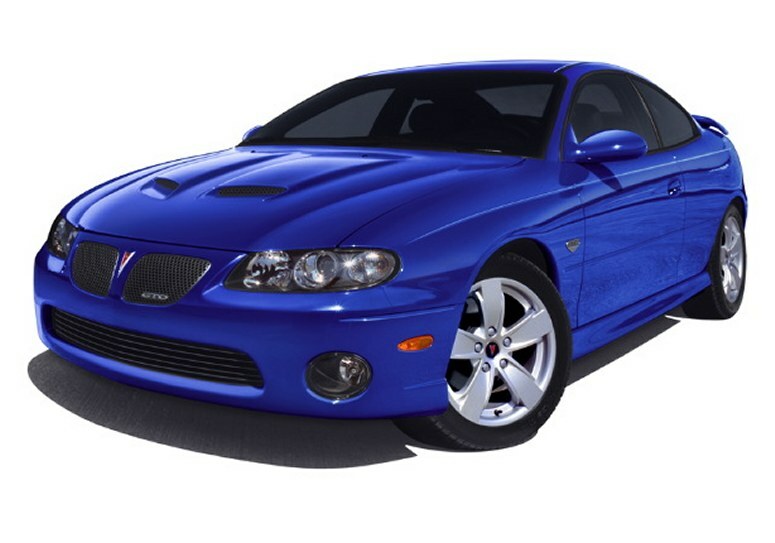 CLICK-> Impulse Blue 2005 GTO, engine view. Marty Hogan, Program Engineering Manager for the GTO, explained some of the specs. This is an LS2 engine with 400hp and 400ft-lbs of torque. See the red VIN tag in the lower right corner? It says PILOT. These are pre-production versions of the 2005 GTO. See the silver unit in the far rightside of the photo? That's an Engine Control Module (ECM). Last year, that was the location for the coolant reservoir. The test cars were ready to go with the keys already in the ignition. CLICK-> This is the layout of the Bondurant road courses. I tested the 2005 GTOs on the West Course (on the left) which is 1.1 miles long. Training for drifting was conducted on the adjacent skid pad. Pick out a helmet. At the Bondurant school, they have a room for that. You know the test drives are going to be goooood at a place that has a room o' helmets and racing jackets. CLICK-> Oh yes, the keys are in my pocket. I'm standing next to a Cyclone Gray 2005 GTO. Thanks to Russell Nainie for taking the photo. Russell is a program engineer on "loan" to the USA from Holden in Australia. Seems like the Pontiac stylists paid some attention to viewer comments throughout the UltimateGTO.com website? According to Jim Hopson of Pontiac Communications, their number one request was to add scoops to the hood. For 2005, Pontiac is answering the call with a standard hood WITH scoops. The dimensions and style of the scoops is just right. If you don't want them, just check off the option for "BSH". I'm pretty sure that stands for Boring Smooth Hood. Okay, I just made up the BSH letters, but you CAN ask for a smooth hood at no additional charge. But why would you want a smooth hood? Tigers have to breathe. But do the stylin' scoops draw fresh air into the GTO�s engine compartment? Sort of. Shh! While Pontiac literature says they "draw fresh air into the GTO's engine compartment", they are not force-feeding it by any means. It's not a Ram Air hookup. The air intake is actually below the left headlight. The aftermarket vendors are rushing to make several styles of hoods and hood kits that let you connect functional air inlets to the air intake system. I've heard that buyers of new '05 Monaros in Australia are grooving on the new factory hood scoops. That visual upgrade could be the thing that makes the car sell a little better. Have you noticed a surplus of 2004 GTOs sitting on the lot at your local dealership? Don't be surprised if those '04 GTO's "BSH" hoods get swapped to the newer style hood with scoops. CLICK-> This is a new color for 2005. It's another view of the Cyclone Gray 2005 GTO from the right side. From the side, this car looks almost like the previous year. Give this car some time to mature. People write me to say they're unimpressed by this car's oversimplified lines. You guys will have to wait until about 2007 for a bodystyle change. But check out how nice the new pipes look from the side. The brakes have been improved for 2005. We've got larger four-wheel disc brakes (11.7 inch vented fronts and 11.3 inch solid rears). The four-channel antilock braking system makes for straight stops everytime. I noticed no fading during my testing. CLICK-> Russell Nainie from Holden is checking out what's under the hood of a Yellow Jacket 2005 GTO. Then there's "my" Phantom Black 2005 GTO. The black car was my first test car. I picked it because I wanted to start driving an automatic, so I could learn the track without needing to concentrate so much on shifting. An engineer told me that the automatic car is actually faster than the 6-speeds. Later, I moved on to 6-speeds. After an orientation drive around the twisty 1.1 mile road course, they turned me loose in my own black 2005 GTO. Huh, am I dreaming? Pinch me. I've got a couple hours to play with this car on a road course in perfect weather. Yup, I'm wearing a helmet, ready to go. Time to slam down the gas pedal and go. I tested a black automatic GTO for many laps, then a gray 6-speed. Both cars were a thrill to drive. Around a curve, they stick to the track really well for a rear-wheel drive car. While driving over bumps, the suspension rebounds quickly without feeling too tight. While lead-footing it around the twisty test track, I realized just how comfortable the seats are. After sitting through a long driving session, there was no hint of posterior fatigue. Over and over, the LS2 engine's power was sufficient to take the car from zero to 60 like a swift kick in the aforementioned posterior. CLICK-> My favorite car there was the Phantom Black 2005 GTO pilot car. If I bought one tomorrow, it would have to be black! Modern GTO owners are often asked by clueless onlookers if their cars are front wheel drive. This photo should answer that silly Frequently Asked Question. Smok'in it up. It's great that Pontiac is offering a rear-wheel car with real performance. The car's standard rearend gear ratio is 3.46 to 1. Was this was a sneak preview of the 2006 GTO? Check out the 2006 GM's Fleet/Commercial Car & Truck Guide. I guess it didn't look enought like the 2006 GTO. Later, Pontiac came out with this version of the shot. Notice the blackened taillights. 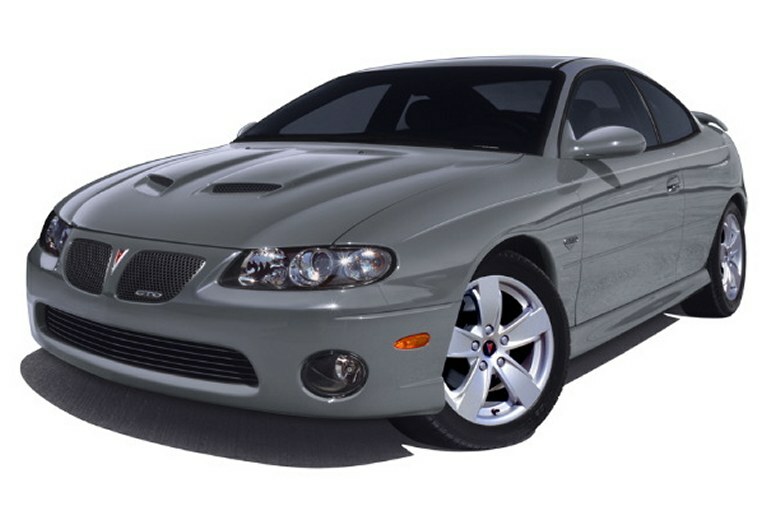 CLICK-> Here's the Cyclone Gray 2005 GTO on the road course. The car's leather-trimmed interior is very quiet. I liked to roll the windows down a bit to hear the sounds from the engine better. While kicking the car around the course, I never noticed one squeak or rattle. This car is solidly built. At the end of the straightaway, the brakes saved me from any late-braking errors I would make. The car weighs a reasonable 3725 pounds, and the brakes felt good in all situations. I made some more laps on the track, pushing the car harder each time around. At one point, Bondurant's Chief Driving Instructor Mike McGovern hopped in the passenger seat and gave me some pointers. He knows a lot, and is eager to show other drivers how to get the most out of a vehicle. Have you ever driven around the apex of a curve and had a person in the passenger seat grab ahold of the steering wheel and guide it deeper into the inside of the curve? It's a strange feeling, someone pushing the steering wheel that's in your hands, but he guided my steering. It helped. I learned which lines to take on the track. Accelerate here - brake here - look ahead further. That's better. After some practice laps, I dared to accelerate into "Fear Factor" territory, at least for me. CLICK-> Trackside in the pits, Jim Hopson from Pontiac Communications (right) talks "GTO" with some colleagues. The gentleman in the background is Todd Carstensen, manager of product communications. The woman in the foreground is Kelly Sallaway, marketing manager for Bondurant. We're trackside in the Arizona sunshine. GTOs are racing around in all directions. Can't help from smiling all day long. Pontiac has yet to publish official track times for the GTO. But the engineers onsite said the auto does 0 to 60 MPH in 4.6 seconds. The 6-speed does 0 to 60 in 4.7 seconds. Fast is what you get when you borrow an LS2 powerplant out of the Corvette. CLICK-> Another 2005 GTO on the course. This one is going down a short straightaway which is adjacent to the pits. On this course, the pit area is elevated. You can stand here and have a good view of the whole 1.1 mile track. As far as the ride of the '05 car, the road feel is quick and responsive. Compared to a Grand Prix which I drove in the summer, this GTO handled better at high speeds. On the curvy road course, the GTO always felt like it was in control, even when I took a corner at a fast speed. It didn't even feel that bad to round off the lumpy concrete corners. There was no bone-jarring sensation. This car has four-wheel independent suspension made up of MacPherson struts and progressive springs in front, multilinks with semi-trailing arms in the back. As in 2004, the transmission choices are limited to two. The good news is, both are adequate. There's the 4-speed Auto Floor Shift, Hydramatic 4L60-E M30 or the 6-Spd Manual Close Ratio, Tremec T-56 M12. As far as the manual transmission cars, I found myself not having to shift them that often. Drive fast or slow, the car seemingly has enough torque to pull itself through any situation. So don't worry so much about which gear you're in, this baby isn't going to stall out. They built-in plenty of low end torque. CLICK-> I'm getting a ride in one of the cars that are prepared for drifting classes. 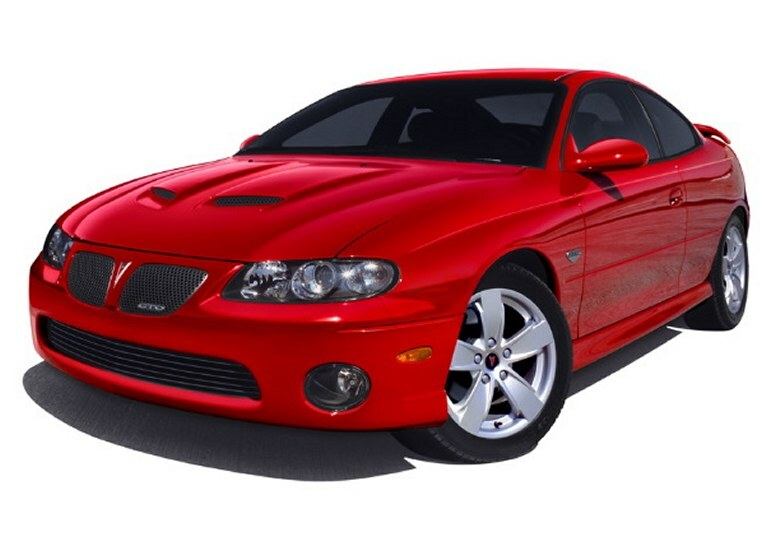 This is a Torrid Red 2004 GTO. The paint color lineup changes slightly for the '05 year. The colors will be: Phantom Black Metallic , Quicksilver Metallic , Cyclone Gray Metallic , Torrid Red , Impulse Blue Metallic , Midnight Blue Metallic , and Yellow Jacket. The car has a good feel for the road at any speed. Direct-acting stabilizer bars and a variable ratio power steering system are tuned to provide a sporty feel and increased driver feedback. CLICK-> Some GTOs waiting to be abused on the track. See the orange one with the shaker hood? That's a customized 2004 car that was displayed at the SEMA show in Vegas the week before. It arrived with the customized yellow '04 that's parked next to it with the dark stripe. Those two cars had aftermarket visual add-ons and performance upgrades. Their owners were there to demonstrate their car's performance capabilities.